India Versus Pakistan : A Battle? When it is India versus Pakistan in Cricket arenas the sports become more a battlefield than a game and the most of the credit to this scene should be given to our news channel who hold panel discussions in the name of ‘Battlefield, The Big Game, Maha Muqabla’ Sabse Bada Muqabla’ etc. The debate in these programs of both the nations have praises for their country and instigation of animosity for the opponent in a way that people watching it started looking it as personal win or defeat. When India lost to Pakistan on 18th June 2017 in ICC Champions Trophy Final these channels who first adored Team India started abusing and demeaning the player. The reactions on social media are more heart breaking. People who are feeling hard to congratulate team Pakistan stoop so low to blame team India and Captain Viarat Kohli for fixing the match. The father –son joke remained in circulation throughout these three days of final (two break days plus one final day) which was not in good taste and can hurt people of an independent nation. The personal relations of India with Pakistan are always brought up in the game. The way politicians and government politicize the issue game has also become part of warring strategies. This if happens with all sports can be digested but it only happens with Cricket which many in India has followed like a religion. 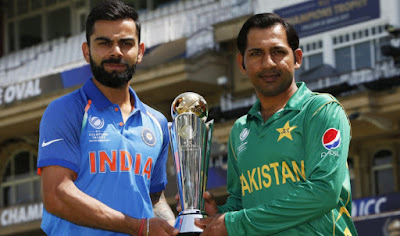 Pakistan’s victory later becomes more distasteful when some people unnecessarily started blaming Indian Muslims for celebrating the Pakistan’s victory. It did happen in part of Kashmir (reasons best known to government) but no such incident came out from rest of India. India’s cricket defeat made people forget two special victory’s on the same day, one of India’s hockey team’s victory against Pakistan in International Hockey League and another of Srikanth Kadambi’s win in Indonesia Open 2017. I am not against people loving sports but I am against undue importance to one game and neglecting others also game should be treated as game and not war. Till next post God bless Indian Sports.